Last weekend, I was fortunate enough to partake in a private wet plate workshop with Dale Bernstein. 2 days on playing and making Ambrotypes, Tintypes and Glass Negatives. This was really a fantastic experience and would highly recommend this to anyone whom has an interest in photography. On Saturday (20-APR-2013), Dale came to my studio with all his gear in hand; There was very little that I had to provide. Within a couple of hours we were shooting my first ambrotype with superb results. Dale walked me through the entire process, from cleaning and prepping plates through the finishing process. By the end of day two, I had enough wet plates to start a small portfolio which is not bad for 20 hours and never working in the particular medium prior to the workshop. Dale really breaks down the process and makes it easy to understand with out getting into the nitty gritty of science behind the process; His approach is that of an artist.. In the amount of time that workshop lasted, I have fallen in love with the process as well as the resulting images from the process. As an added bonus, my studio smells like lavender from the varnishing bonus. With all of that being said, I have pulled my Toyo/Omega 45D out of retirement and have purchased a plate holder for the camera. Soon I will be gathering up the rest of the equipment needed to go off on my own wet plate adventures. 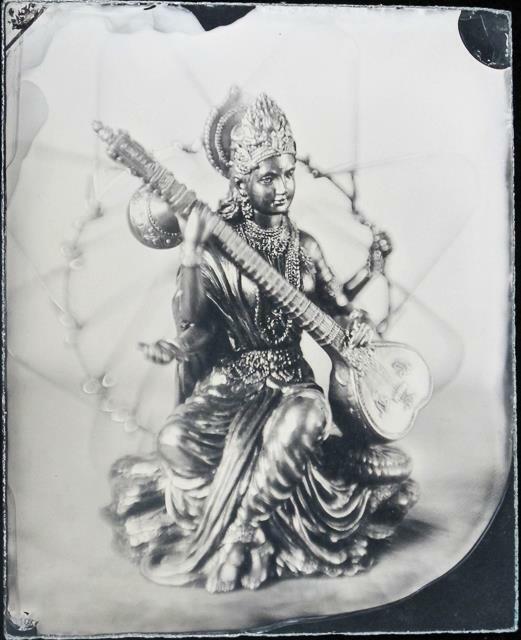 In 1851, Frederick Scott Archer introduced a wet plate process, sometimes referred to as the collodion process after the carrier material used. The process is simple: a bromide, iodide, or chloride is dissolved in collodion (a solution of pyroxylin in alcohol and ether). This mixture is poured on a cleaned glass plate, which is allowed to sit until the coating gels but is still moist. The plate is then placed in a silver nitrate solution, which converts the iodide, bromide, or chloride to silver iodide, bromide or chloride. Once the reaction is complete, the plate is removed from the silver nitrate solution and exposed in a camera while still wet. The plate loses sensitivity as it dries, requiring it to be coated and sensitized immediately before use. It must also be developed while still moist, using a solution of iron sulfate, acetic acid and alcohol in water. The sensitivity of silver halides to light is the underlying principle behind most types of 19th century photographic processes (Daguerreotypes, Ambrotypes, Calotypes that use paper negatives, and wet and dry plates) as well as modern 20th century photographic film processes. Follow Dale on his blog at http://dalebernstein.blogspot.com. Dale’s contact information is on his blog if you are interested in taking one of his workshops, or set up a private workshop.